Trading the forex market involves much complex procedure which requires extensive knowledge of the financial industry. There are many professional in the world that prefers to trade the synthetic cross pair in order to experience high liquidity. They compare the like currency rate of the major pairs and make a synthetic cross pair. Making synthetic pair from the major pair and trading it in the real market with live currency rate can be extremely difficult for the new traders. But if you want to build a strong trading career then you must know how to build synthetic pair since their high volatility will help you to make a sizeable profit in the forex market. But always remember trading the synthetic pair at the initial stage is highly risky and this synthetic pair should be only be traded by the long-term, professional traders. Basically, traders make the correlation of the two major pairs containing the green bucks and create a new pair which is known as a synthetic pair or exotic pair. Let’s see how the professional traders create synthetic pair and trade them in the real market. Before we go more into the details of synthetic pair lets site an example why we need to create a synthetic pair. For instance, retail traders want to buy to the GBPJPY. But in order to buy the GBPJPY they need to buy two major currency pair in the forex market. They must buy GBPUSD and USDJPY simultaneously in order to buy GBPJPY pairs since there is not enough liquidity in GBPJPY. Still confused? No worries! Let’s see a simple diagram for synthetic cross and everything will be crystal clear to you. So, you can see clearly that the retail traders can also trade the synthetic pair by following these simple steps. But before you master the true art of forex trading the synthetic pair is very risky since the volatility is extremely high in synthetic pair compared to the major pairs. You should try synthetic pair only if you have strong knowledge about the major pairs. Many traders often think that only technical analysis of well enough to make you strong in this sector. This statement is somewhat true if you have strict trading discipline and put your trade only on the major pair. But if you are thinking to take your trading career into next level then you should also consider fundamental analysis as one of the most vital element. The synthetic pair is only for long term investors since the relative volatility is extremely higher in exotic/synthetic pairs. Always remember that buying the synthetic pair always involve three countries currency. 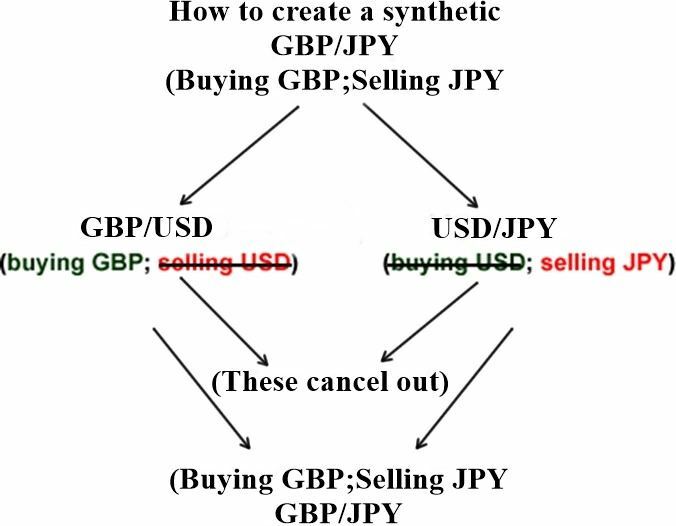 Unlike the major pairs, you are buying and selling three countries currency when trading the synthetic pair. In another way, we can say that two pairs are being traded while we open any position in synthetic pairs. Many traders often wonder why the spread is so huge in a synthetic pair. The answer is pretty simple. Brokers are adding two major pair spreads used in the creation of synthetic pair and imposing a new high spread for the traders. So if you are scalper then it would be nearly impossible for you to make the consistent profit by covering the large spread. Honestly, this pair is not for the scalpers. On the country scalper uses tight stop loss and their trade is more likely to hit their stop loss due to the high volatility in the synthetic pair. However, there are some professional who also scalp in the synthetic pair by using simple technique but always remember exception can’t be an example. Most advanced synthetic pair traders prefer trailing stop loss features in order to maximize the potential profit from their trade. And another important thing about synthetic traders is, they always trade in the direction of the prevailing long-term trend. Long-term investors always prefer synthetic pair in their trading. They know that the market will remain extremely volatile compared to other major pairs. So they use large stop loss and aim for huge gain while trading the financial instrument. They also use higher time frame charts while taking any trading decision because large time frame tends to produce more accurate and stable result. Most professional traders always consider fundamental analysis as their strong trading tools. They draw a close relation line between the three currency economies and make a sequence of their economic performance. Based on their researched fundamental data and technical analysis trained professional execute their trade using the live currency rate of the synthetic pairs. Summary: Trading the synthetic pair can be extremely profitable if done properly. There are many new traders in the forex industry who are losing tons of money in the hands of greed just by trading these high volatile pairs. On the contrary professional forex traders are taking the maximum advantage of this high volatile pair. They are simply creating a synthetic pair and trading the differential live currency rate in the financial market. The best way to trade the synthetic pair is by using simple support and resistance level along with price action confirmation signal. Though there are many different ways of trading the synthetic pair but price action strategy tends to minimize the risk involve in synthetic pair trading. As a synthetic pair trader, you must follow proper money management .Unlike traditional risk management you should look for higher risk reward ratio like 1:3 or more to make consistent profit in the long run. A solid grip of fundamental knowledge is also required for successful synthetic pair trading.